Ok, time to get caught up on side dishes. This one I served with Easter dinner. YUM! 1. Toast pine nuts (or almonds) in a medium dry skillet over medium-low heat, stirring constantly, until lightly browned and fragrant, 2 to 3 minutes. Transfer to a small bowl to cool. 2. Add oil to the pan and heat over medium heat. Add onion and salt; cook, stirring occasionally, adjusting heat as necessary, until soft and golden brown, 15 to 20 minutes. To save even more time, you can always buy the already cut and packaged broccoli florets. But for the price, I'm fine with cutting the broccoli. 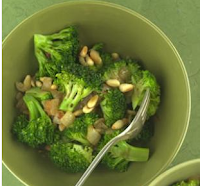 Since I had pine nuts that needed to be used sooner than later (with later being more like having to pitch them), this recipe was a double plus. By prepping the broccoli ahead of time, all I had to do was take the container from the fridge to the microwave. Gotta love the microwave steamer - easy way to cook veggies while still retaining all their nutrients. This recipe is definitely a new favorite way to prepare broccoli!